I have been very quiet on my blog lately, because it is time for SECRET PROJECTS!! I am writing this on Thanksgiving morning (Nov 22, 2018) in the USA, but will schedule it to post for “after dinner”. 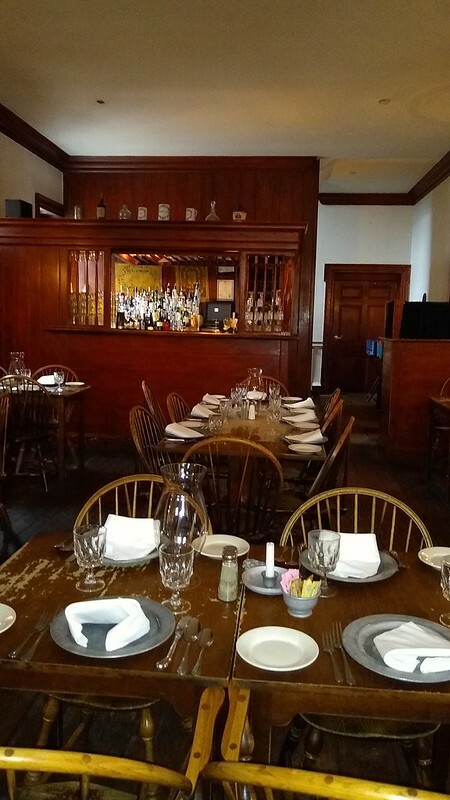 Thanksgiving Day feasting will take place at my daughter’s home and we have a bit of a drive to get there today. My SECRET PROJECTS are being delivered there today, which is why the delay in the post going live. I like to gift before I show them on the blog! 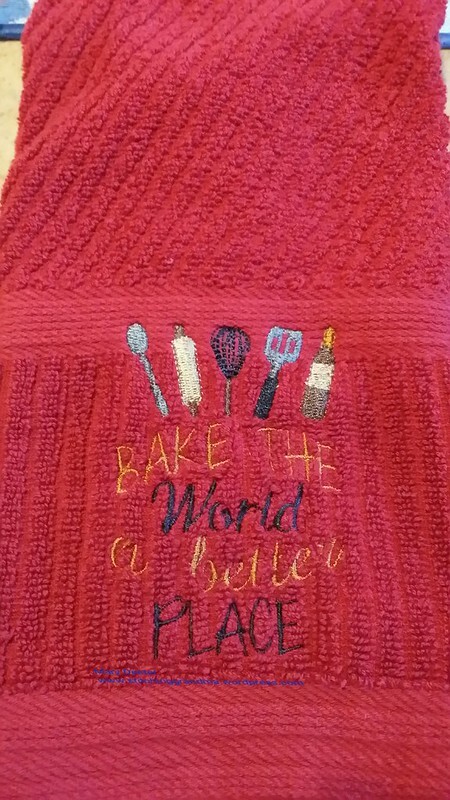 I’ve been playing with my embroidery machine a lot lately. It seems that I can manage the embroidery machine and changing threads pretty well, 6 weeks post-op. 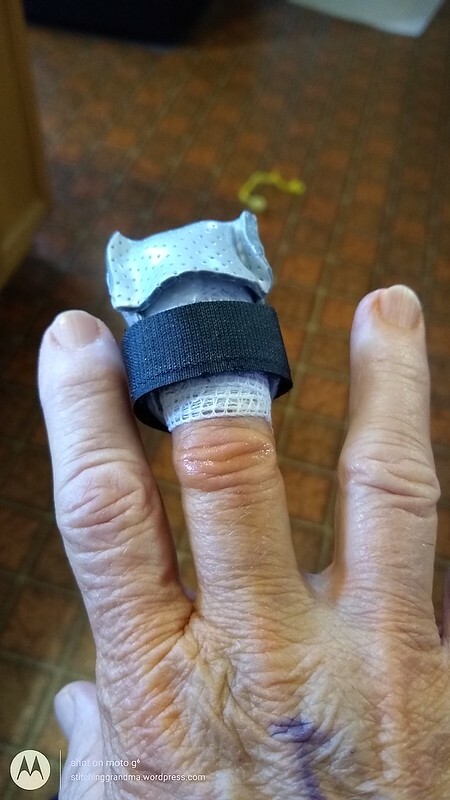 My fingers are still pretty stiff, but moveable, and the surgery site is now healed nicely. 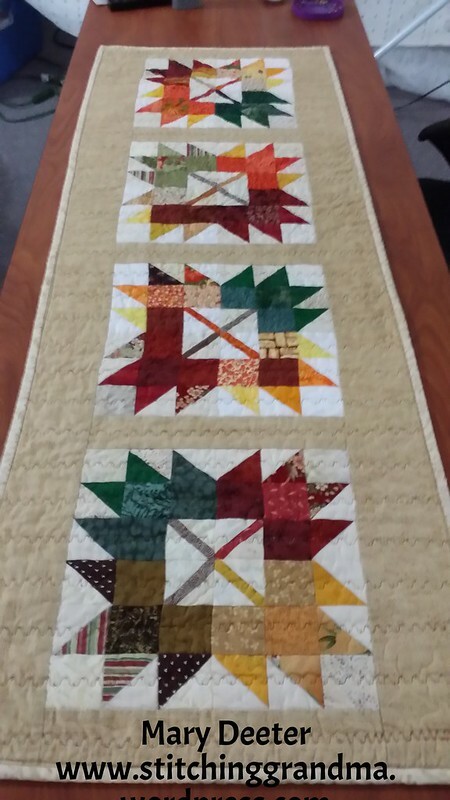 I have done some sewing, webbing together the quilt top for the My Carolina Home Hurricane Quilt Drive. Now I need to clean up the embroidery supplies, pack away the box of stabilizers and make room at my sewing machine to get the rows on that webbed top stitched. 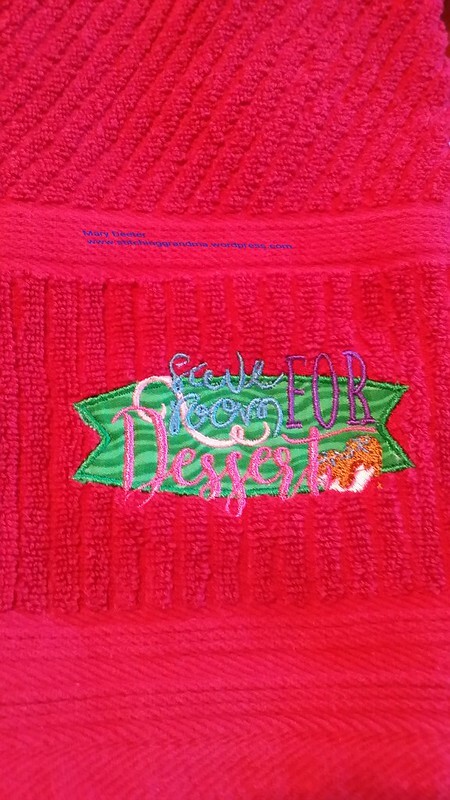 My motivation will be delivering it with the backing fabric and the batting at my Queen Bees gathering on Tuesday! Before I show you my SECRET PROJECTS, I want to share another story. We have 3 cats, one outside and 2 inside. 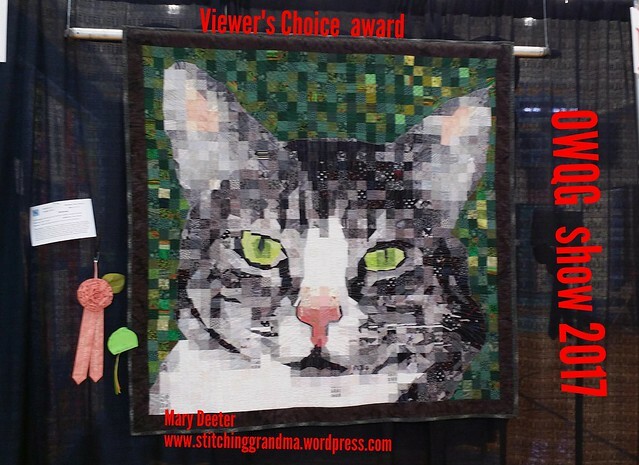 If you have read my blog for any length of time, you know about my cat Mittens….of the pet mosaic quilt. Mittens has chosen my husband to be “his person”, while Smokey has chosen me to be “his person”. Our outdoor cat is their mother, and she has chosen us both. She really like my husband “better” than me. Anyway, here is the story. Hubby does floor exercises daily for his back, and Mittens likes to help him. 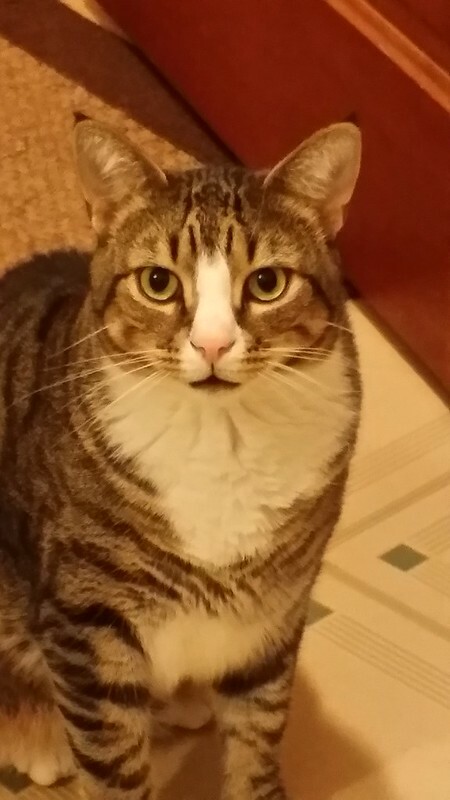 While he is on the floor stretching, Mittens loves to chase his shadow, get petted etc. Well, one day a little over 2 weeks ago, hubby stopped petting Mittens while he stretched, and had his head turned away. Mittens decided he wanted more attention and pounced, as cats will do. Along with the pounce came a “love bite”…only this time, it was a BITE that broke the skin and punctured into his hand, 4 canines! Got the hubby’s attention, got Mittens some negative attention as a result! Hubby washed it off, and didn’t think much about it until 72 hours later when his hand got swollen, and red marks appeared. A trip to the doctor was already on the calendar, so he showed it to the doc at the appointment and was immediately put on antibiotics, and scheduled to return the following day. By the next day, the swelling was worse, a red streak up the arm and the doctor took one look at it and sent him to the Emergency room for IV antibiotics. Long story short, he spent 3 nights in the hospital, with IV antibiotics, the surgeon checking periodically to see if he might have to do his bit to clean out the hand etc. The hospital stay was followed by another 15 days of antibiotics. 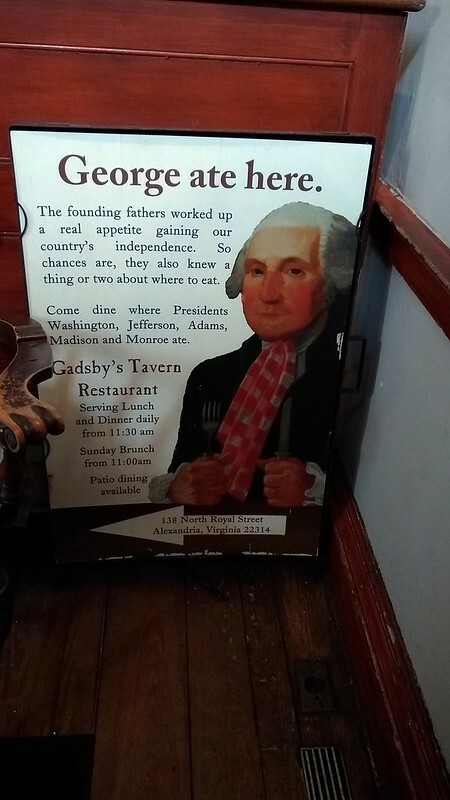 Fortunately, he did not need the surgeon, and is on the mend! Moral of the story according to our family doctor – a cat bite is the WORST bite you can get. He told us that we must come in to see him if it ever happens again, and get on antibiotics immediately! Turns out, cats have bacteria on their teeth that gets “sealed in under the skin” when the teeth retract from the bite. The wound is considered a puncture wound, and no amount of washing & application of antibacterial cream will reach the bacteria. Web MD has some really good information. I read that before the visit to the doctor the first time, so I knew what was coming. So between recovery from my own surgery and dealing with hospitals for hubby, I have been able to spend time in my sewing room. I do feel like I have given the embroidery machine a good workout. Some secret projects will wait for after Christmas for the reveal, but others, you can see now. I stitched them out on vinyl that I picked up on Sunday. 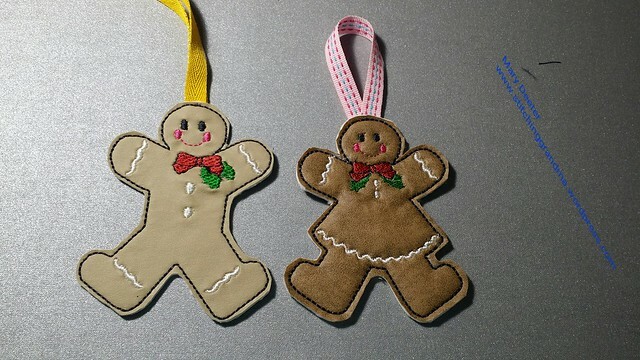 I also stitched out some on craft felt and I like them too! 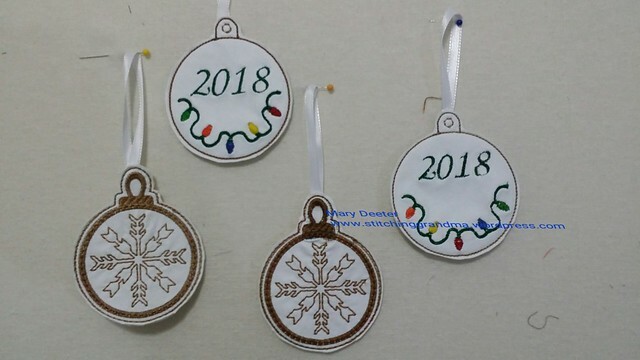 They were so much fun to stitch, and I thought they would be fun Christmas ornaments for this year for each of the grandkids. 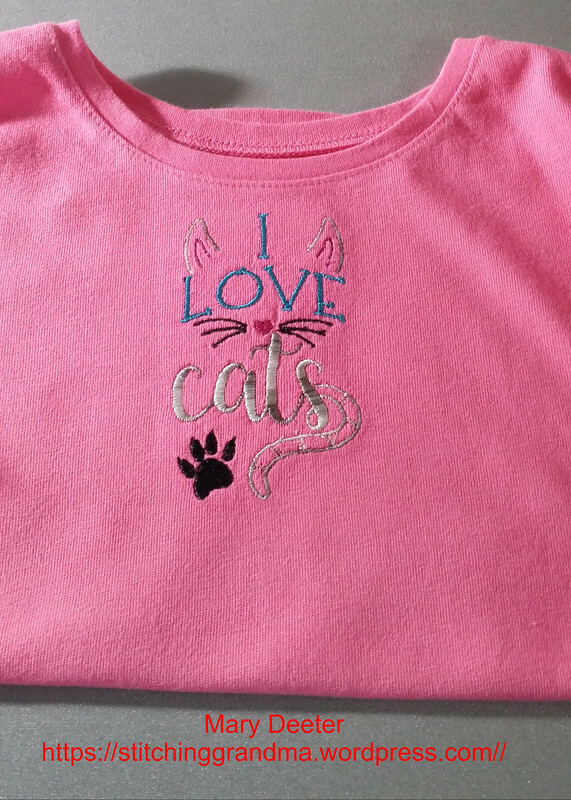 This is a first working with vinyl on the embroidery machine, and each time I played a bit with the stabilizers, toppers etc. Overall, I had fun and I am pleased with the outcome. I also thought I would take the Thanksgiving host a few dishtowels. 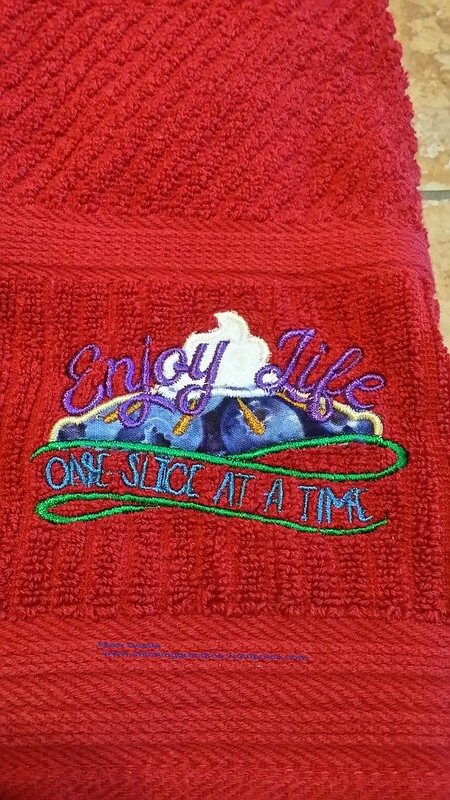 These terry towels I picked up last winter, and have been “waiting” for the right time. I have now run through about half of my supply, but have a few left waiting to be used for other projects. Thanks for taking the time to read my posts and for taking the time to comment. I hope you have a lovely holiday weekend! I went to a “newcomers” orientation with Ocean Waves Quilt Guild on Monday. I’m a “member of the board” and was asked to come and talk about 3 or 4 different activities within the guild, including “Second Time Around”. 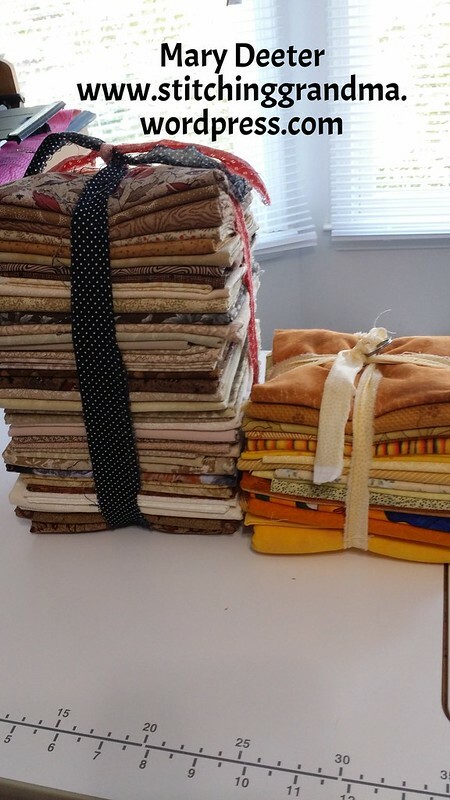 If you are a new follower, let me explain — My committee receives fabric and quilting notions from donors and we “make it pretty again” by pressing, trimming, folding and “selling” back to the members of the guild the day of our monthly meeting. Funds we raise support our guild and enable us to have speakers from around the country. When I get donations, sometimes I have to ask others “what” an item is or how it is used. 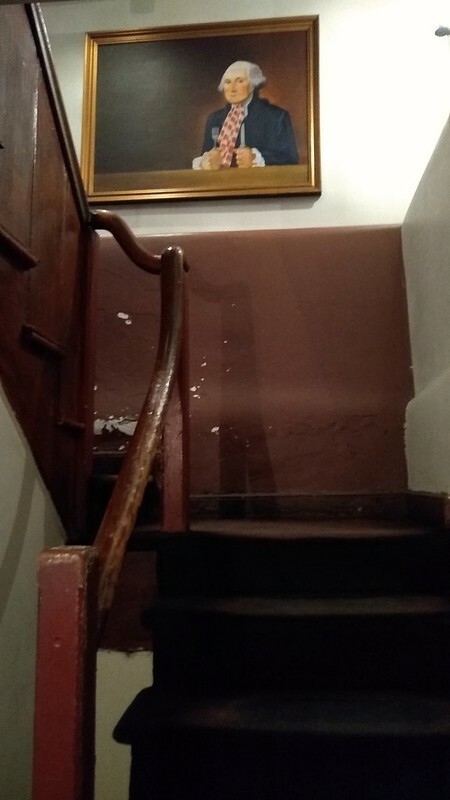 This is because I didn’t have an association with the hobby in the “previous” century, and I am aware that the hobby has changed dramatically since the 1970’s, the 1930’s and centuries prior. 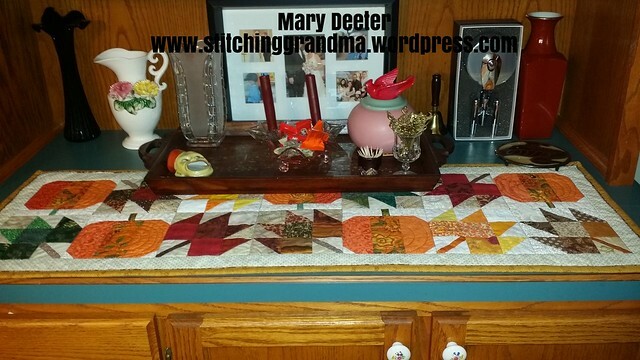 My quilting “journey” began in 2008, and I learned to cut with a rotary cutter, learned how to cut strips with the June Tailor slotted ruler. Some tools I see, I honestly haven’t experienced, yet my long departed grandmother would know exactly how to use them. There is a resurgence in the quilting world to use vintage sewing machines, and to do hand work. 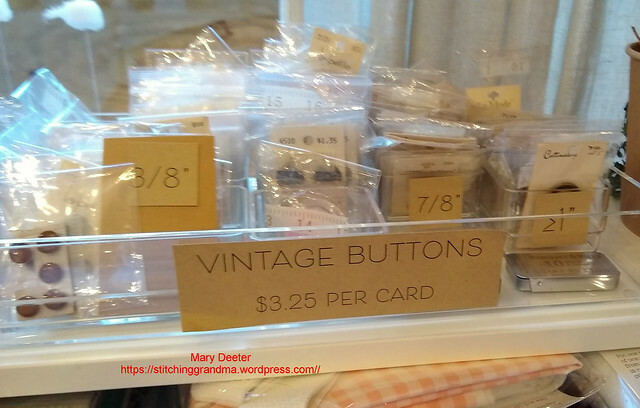 I learned at my grandmother’s knee how to thread her black Singer sewing machine, and she taught me the basics of sewing buttons on etc. 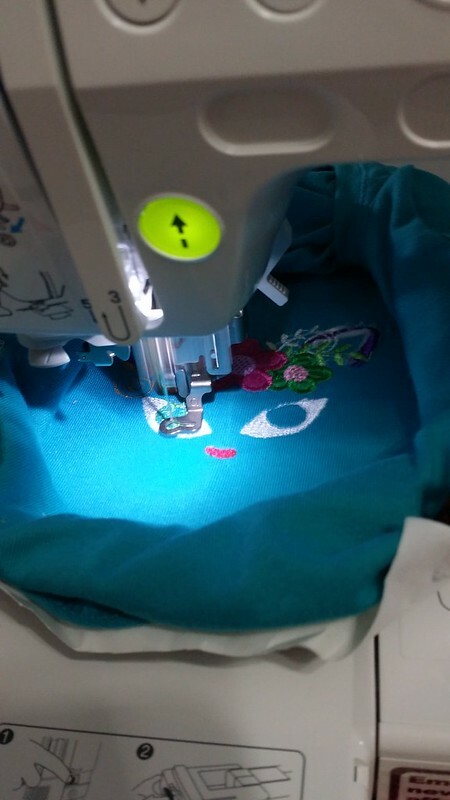 I learned this year how to sew a button on using my Janome. Guess which way I like to attach buttons?? What was neat at the newcomers orientation is the WIDE variety of methods members are using in quiltmaking. 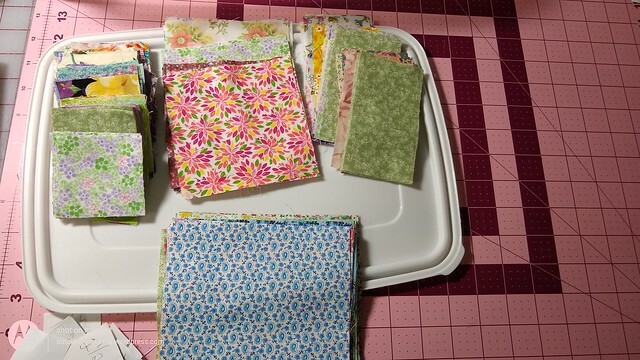 Some are employing centuries old methods, like “needle turn applique” and “English Paper Piecing” while others are happy to work on t-shirt quilts and use those modern quilt kits that come with jelly rolls, and fat quarters and pre-cut 5 and 10 inch squares. It was wonderful to see an entirely hand pieced project, and beautifully long armed projects too. It was also wonderful to see a “first quilt”, recently made. 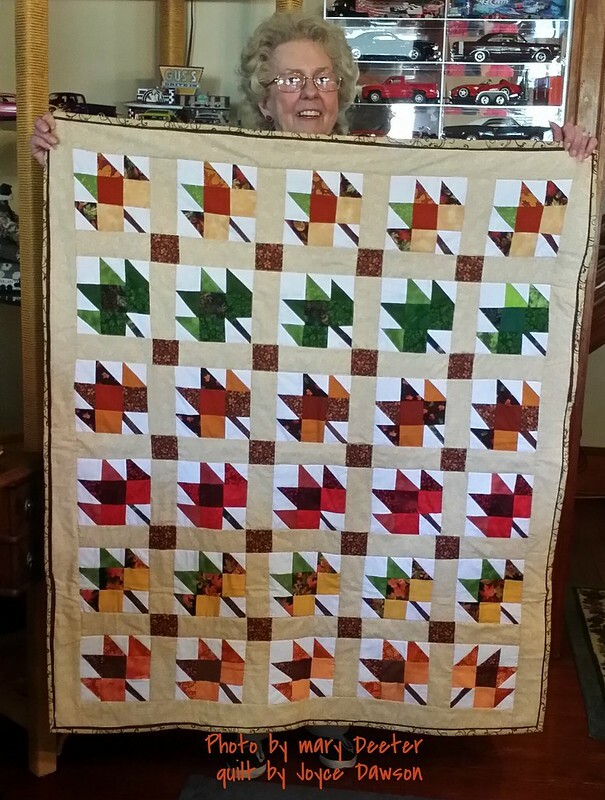 We all encouraged that new quilter to enter her project in our April 2019 quilt show. 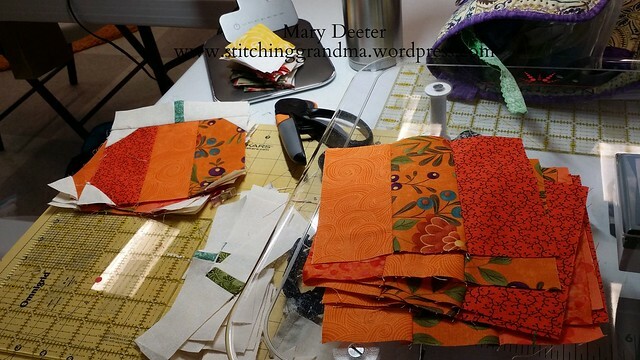 My blog post yesterday about “machine binding” may have made a long time quilter gasp in horror that I would dare to enter a quilt in a show with a machine binding. I’m sure much the same way as the quilter who had always made her own templates out of paper or cardstock when they stores started to carry that plastic template material, or when “gasp” rotary cutters and rulers came into being, or when the Accu Quilt Die cutting machines hit the markets. Today, you can buy kits with everything pre-cut, with applique pieces digitally cut with “fusible” (gasp) on the back. Yes, quilting is here, in the second decade of the 21st century, with more technology that some might want, and technology that some of us crave. I am the first to try a new gadget or tool. I am also the one who says “my brain is not ready for another computer program to learn”. My husband and I have two very different hobbies, yet they both are growing in leaps and bounds in the 21st century. He was dismayed yesterday when he read a comment on a group he belongs to about model railroading. The comment was very negative to the person who posted about finding a way to “cut out his building parts” using a Brother Scan N Cut machine. The person writing the comment berated the man for not being a “real modeler” and that he “should be cutting those window out with an exacto blade etc… My reaction was something akin to “B.S.”…..”that’s like telling a quilter that she didn’t make a “real” quilt, because she sent it out to be long armed, or because she didn’t “hand quilt” the quilt. Maybe others think the same of me because I use machine binding. Personally, I think there is enough “room” in the hobby for all methods, and all tools and all INTERESTS. My interests lie more in getting “finished” than languishing over a project for years and years. 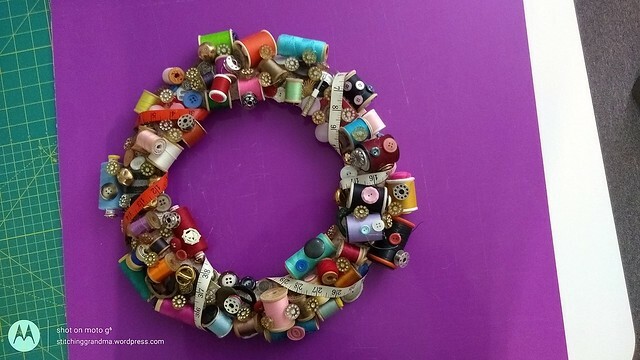 I like “machine binding” and “machine embroidery” and “rotary cutting” and “fusible, machine applique”. No, I don’t “quilt by check” but I do machine quilt. And I learned to quilt free hand on a long arm…1 quilt down, but not award winning quilting like some who quilt professionally. But, it’s done! And I did it, and I take pride it what I have learned along the way. I think there is room for all levels of interest in this diverse hobby. 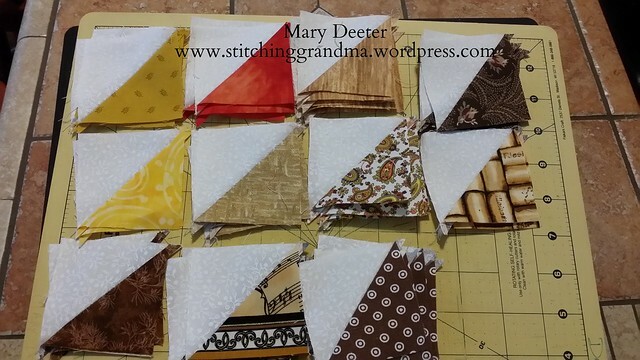 I’m sure you have heard some speak negatively about a quilter who doesn’t do a particular task “the right way” etc . Is your “right way” the “only way”? Is there room in the hobby for that attitude? I don’t think so. I think we need to be kind, to be helpful when someone asks a questions and wants to learn and also that we learn to not be our own worst critics. Try to remember, a hobby, defined by Merriam-Webster is “a pursuit outside one’s regular occupation engaged in especially for relaxation”. 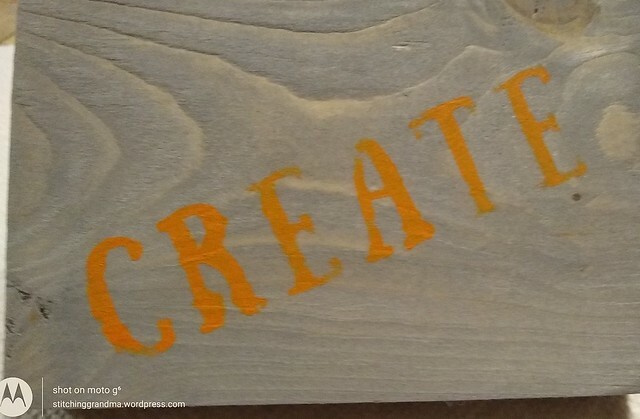 Other definitions include – A hobby is an activity that you do in your spare time for fun . 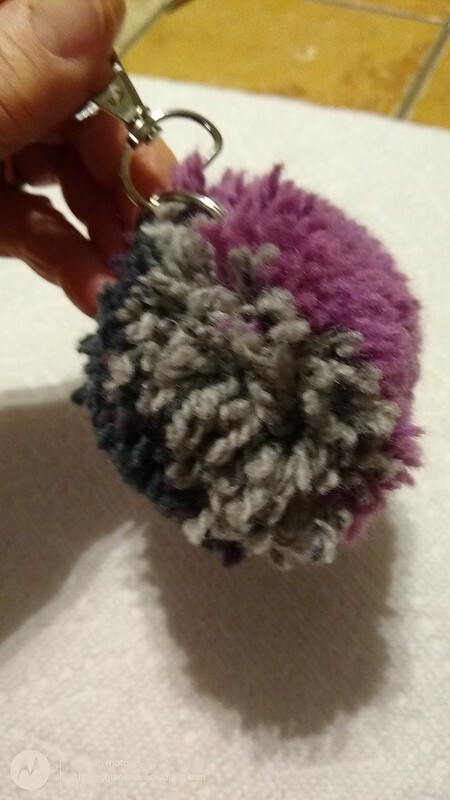 Retirement brings lots of spare time, and this grandma is having fun! I’d love to know if you have been active in the hobby for a long time about the changes that have been made that you embrace, and those changes that you chose not to embrace and why not? No judgements from me. Just tell me how the hobby has changed during the time you have been part of it, and what you like or dislike. 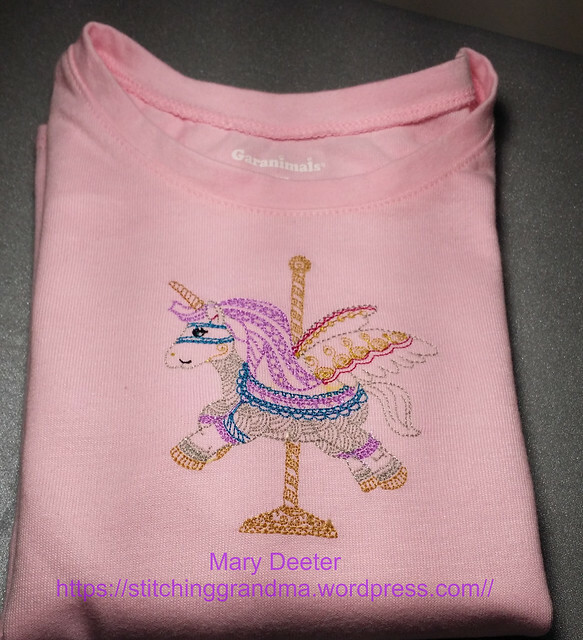 I figured out last week after attending the embroidery club gathering that I could hoop stabilizer, and so this week I have been working on long sleeve tee shirts for my youngest granddaughter. I order 2 packages of shirts from WalMart.com and washed them to “pre-shrink” when they arrived. She is just growing into a 4T and these might last her through the winter. I’ve enjoyed going through my various notebooks of designs and picking things that would suit her. 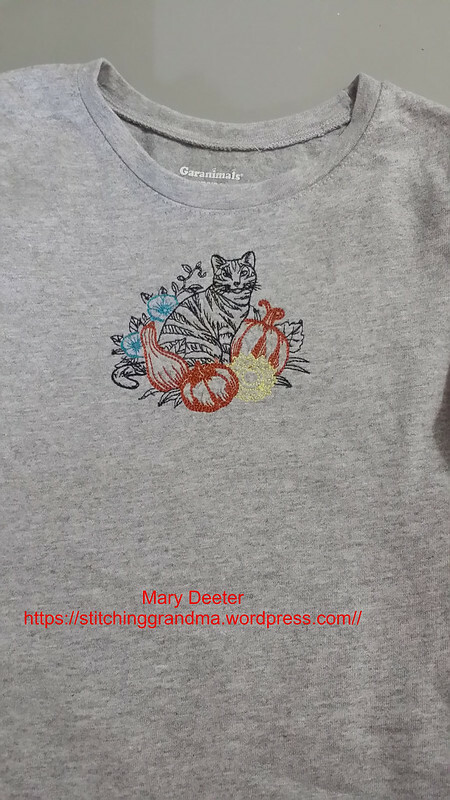 This “sketch” design seemed a little light on the pumpkins and squash, and I ran the stitching a second time. I should have run it again on the yellow flower or chosen a bolder brighter yellow. 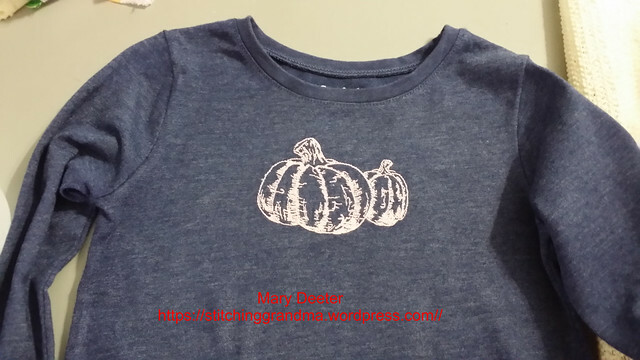 Next up were pink pumpkins on a blue shirt…. The next package of t-shirts were pastels, and I searched for “non-seasonal” designs in my notebooks. 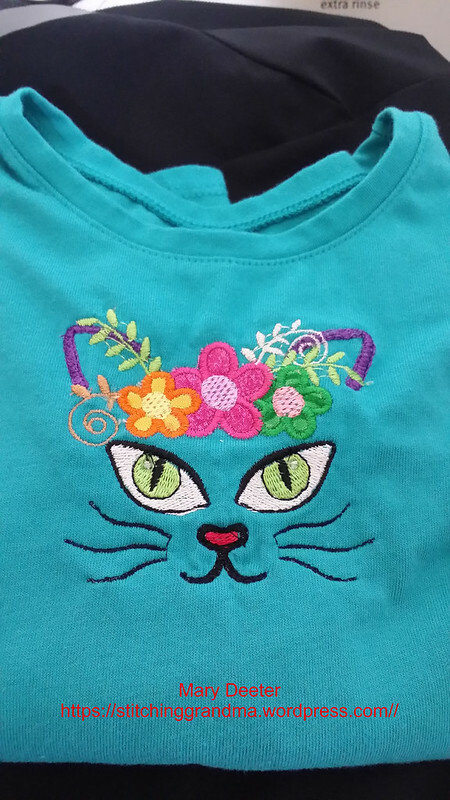 This was the most challenging design of all with 3 pieces of applique and MANY thread changes. Can you tell what it is? Hooping those little t-shirts is a challenge, trying to keep all the stuff “out of the way” while it stitches. The next two shirts I finished up this afternoon. Who doesn’t want to ride on a pegasus unicorn on the carousel?? And the final one…I couldn’t resist! All of these designs were for a 4×4 hoop, stitched out on my Brother PE500 machine. 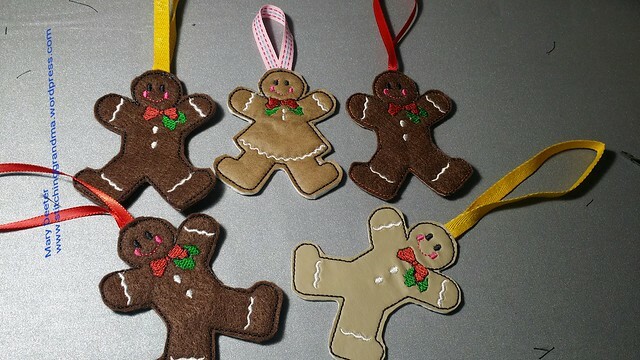 The designs were from Oh My Crafty Supplies. 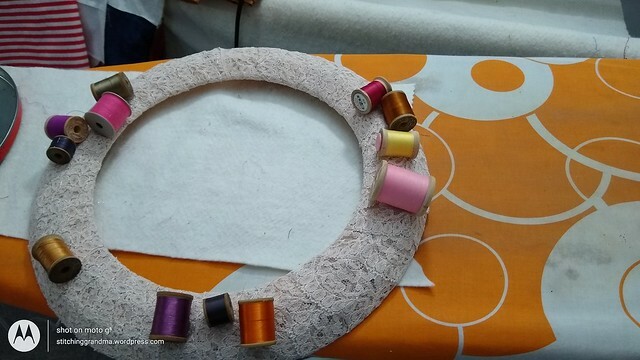 I used Floriani Sticky back stabilizer in the hoop, and Floriani no show fusible mesh on the back of the shirt, and Floriani water soluble stabilizer on top. 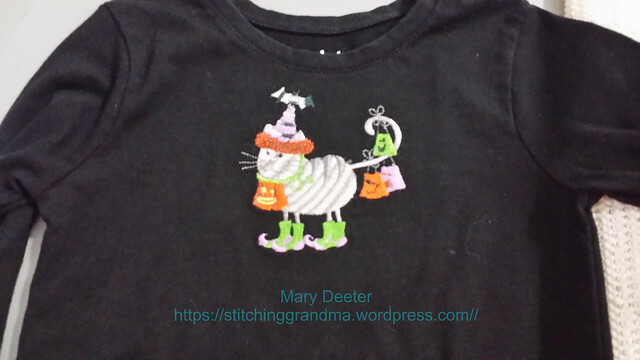 I also backed the shirt after removing from the hoop and clearing jump stitches with a soft product called Cloud Cover (brand unknown) that would keep the thread and stabilizers from scratching a small child. I used primarily Embroidex thread. 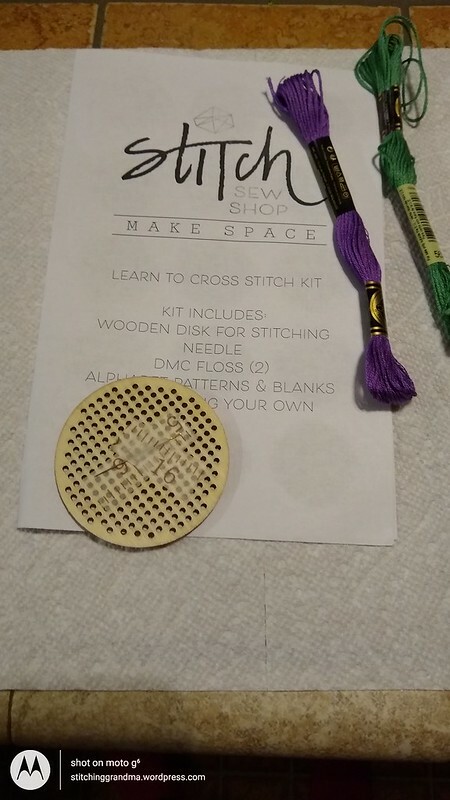 (That variegated thread I was sent for free one year at Christmas from Embroidex). 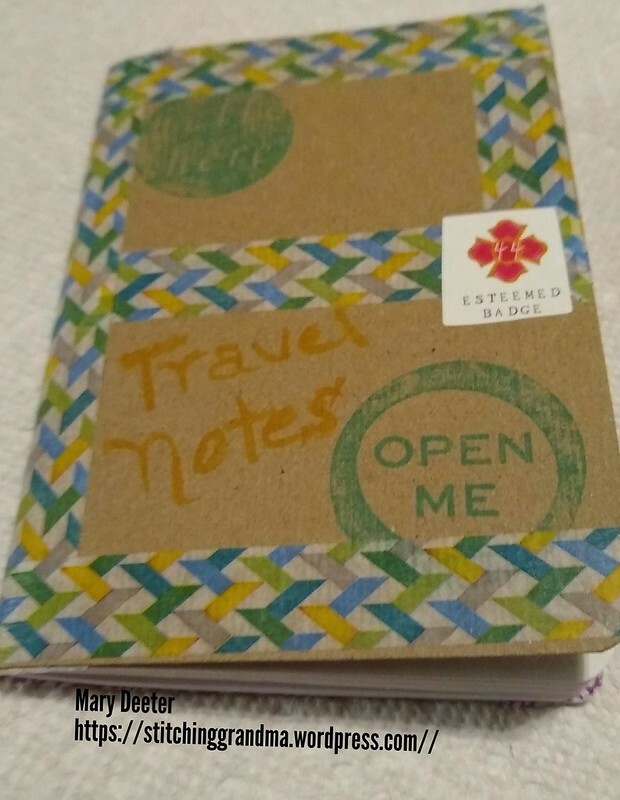 These fun projects kept me busy this week! Fall is a time to get “ready” for winter, and those cold cozy nights ahead. Of course, that means QUILTS. 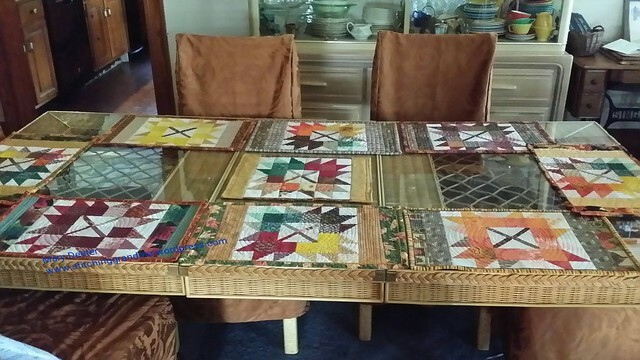 Or table runners or placemats or Christmas projects. I love the colors of fall fabrics. When the fabric colors are inspired by nature, how can you go wrong putting them together in a project. 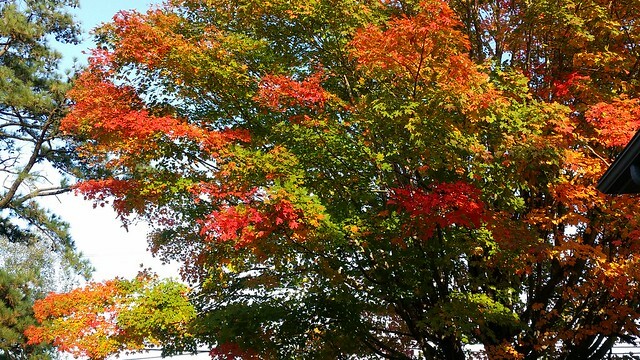 My maple tree in the fall of 2016 was glorious! My husband and I were in the local quilt shop earlier in the month and I had to stop and touch every bolt of those beautiful fall fabrics. I used great restraint not to bring home more fabric than what I went into the shop for specifically! If you have been following me for any amount of time, you know that I enjoy sewing along with Carole and her blog – From My Carolina Home . Carole is in full AUTUMN JUBILEE mode! The link above is to the B Block of the current sew along. Last week was pumpkins, but I am not telling you what this weeks are…you have to go look for yourself. 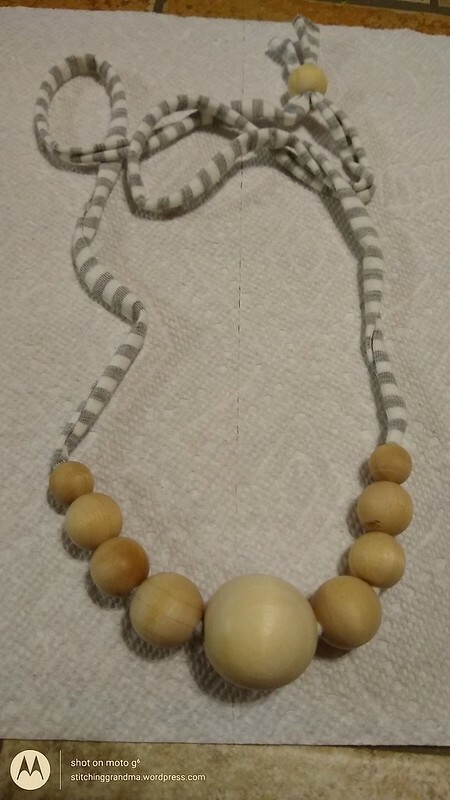 This is the 3rd season I have followed along with Carole, and I enjoy seeing the new patterns and projects she comes up with. Truth be told, I did not make the 2017 projects. I am still sewing blocks from 2016. And my Pumpkins from 2016 getting prepped! So, since the first AJ that I followed in 2016, I have had fun with the pattern. 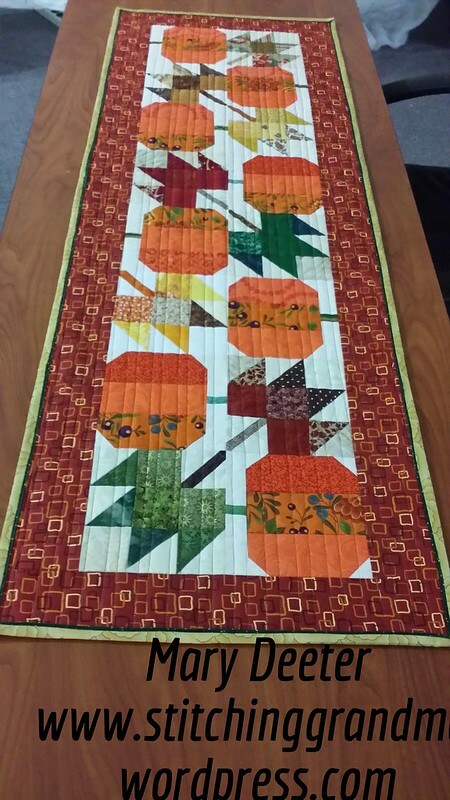 I finished the 8th placemat this year, and will work on 9-12 next year! Hoping for a bigger dining table some day! 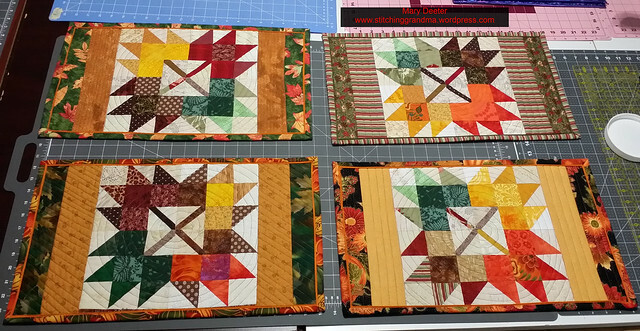 The blocks that are showing up inspired by 2018 Autumn Jubilee month look interesting….and I wish I was able to sew along. 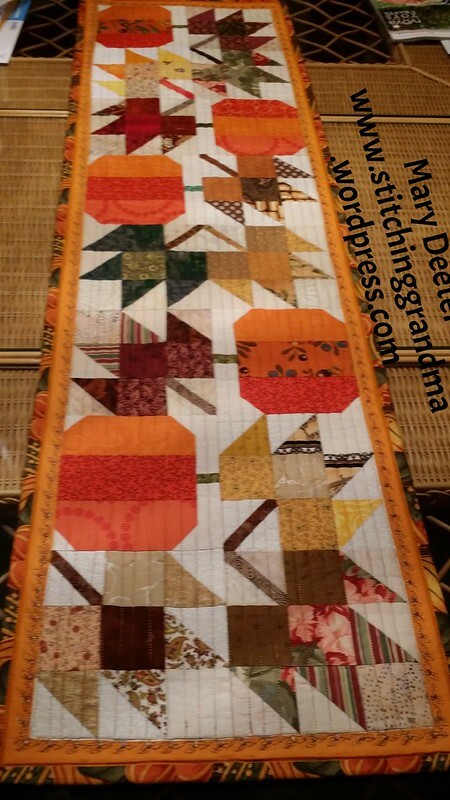 I’m saving the patterns for now, along with the 2017 “Stars on Autumn Lane”. I have a few of those hanging on my design wall….. I had fun looking back at my projects and sewing along. I hope you did too!